I recently acquired a Trident Alpha 10242 NASHVILLE in what can only be described as derelict condition. 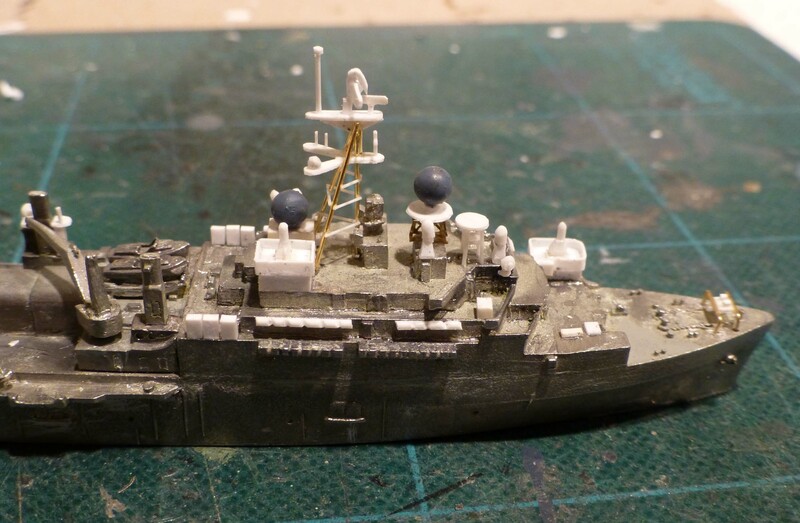 The model not only had a horrible paint job, but it was also missing its large tripod mast. 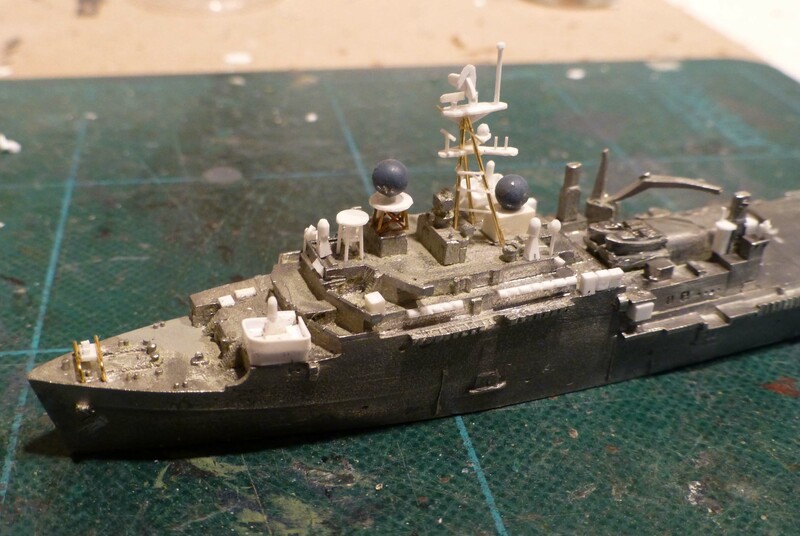 I bought it with the idea of converting it into one of the ships of the class as they looked during the past decade. The factory model represents the NASHVILLE and some of her sisters (CLEVELAND, DUBUQUE, DENVER, JUNEAU, CORONADO, and SHREVEPORT) as they were when first in service back in the late 1960s. To do that I had to remove some parts and add many others. So after stripping the paint off, I filed off the four twin 3" gun mounts and shields. There were a couple of other minor changes to make and then I began adding parts. These photos show the model after most of the new parts were added. I made a new tripod mast and used metal BBs for the two large radomes. The wire antennas were left off until after all the painting was done. 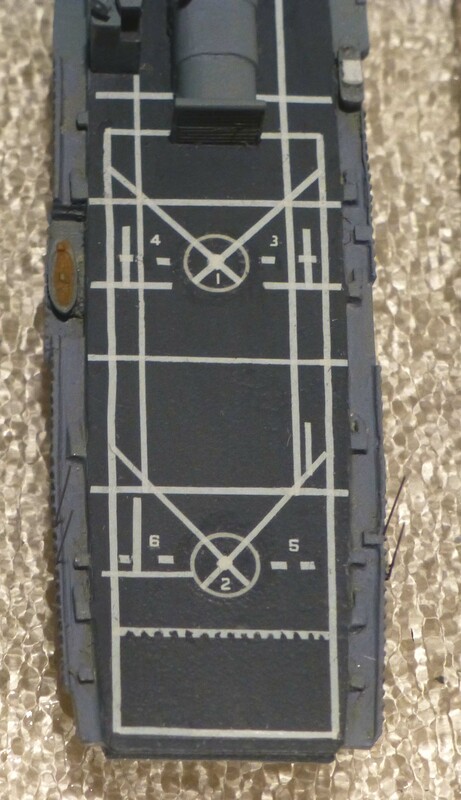 The most time consuming part of that was applying the decals to the helicopter deck aft. I had official Navy Dept documents showing these markings and their locations, so I was at least able to follow a precise plan. 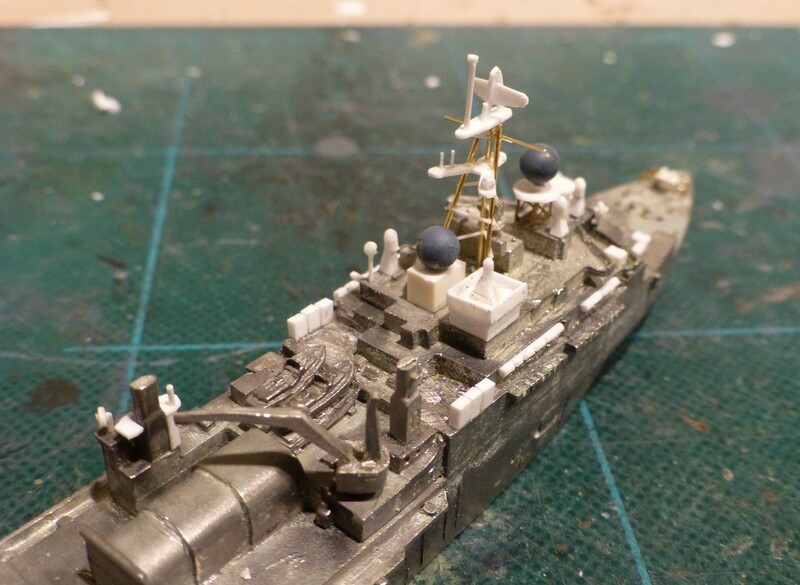 After completing the paint and decal work, the wire antennas were added to the model, and the model was sprayed with DullCote to seal it. The finished model, representing DENVER LPD 9 is shown here. Although I did not consider this a difficult conversion to do, I cannot recommend it for a beginner.